Few getaways offer the allure of North Carolina’s Lake James. Crescent Resources called on Jeremy Early Trailworks to build a 3-mile trail that stretched from one end of their Lake James development to the other. 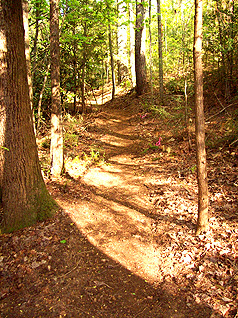 The natural trail allows residents to walk the entire community without stepping into the streets and connects them to beautiful Camp Lake James. When a Florida-based developer had designs on their first mountain community, they needed a trailbuilder familiar with the Carolina terrain. They turned to Jeremy Early Trailworks. Our 4,000-foot hand-cut trail wound playfully through the 6,000-acre property and fit perfectly with the luxury community’s other amenities. Built with young homeowners and families in mind, The Lodges at Winkler’s Creek needed a trail befitting the property’s lush setting. Jeremy Early Trailworks delivered. A 7,500-foot trail system meandered throughout the community, coaxing residents past stands of majestic pines, rhododendrons, and hemlocks. Two creeks. Waterfalls. Towering views of the Smokey Mountains to the west of Asheville. Sunset Falls had it all – except a trail. Jeremy Early Trailworks provided the finishing touch on this high-end mountain retreat with a 2,700-foot trail.